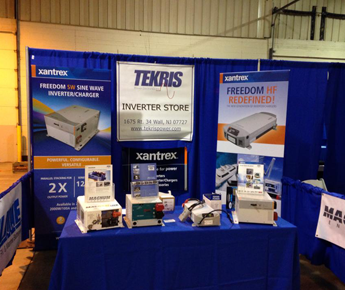 TEKRIS Power Electronics Inc. is an authorized power conversion service center that focuses on alternative energy solutions. We are one of the few companies that sell grid power solutions for commercial, residential, and mobile energy consumers. Backed by more than 35 years of experience in the sales and repair of power inverters, our business is highly recommended by the factories whose products we sell. When you need off-grid solutions, you can trust our company. Our owner, Chris Hanrahan, has personally trained all of our technicians and administrators to ensure excellent product selection and repair services for you. We can service power converters, batteries, and chargers of all types if they are ever damaged. Our primary goal is providing you with energy solutions from well-known companies in the industry. Whether you are seeking power inverters for RVs or you need a battery for boating, we are prepared to help you with your needs. Our owner, Chris Hanrahan, has personally trained all of our technicians and administrators to ensure excellent product selection and repair services for you. We can service power converters, batteries, and chargers of all types if they are ever damaged. Our main goal is providing you with energy solutions from well-known companies in the industry. Our location in New Jersey can fulfill orders from customers throughout the nation. Our all-inclusive services include the sales of the power converters that you need as well as technical repair services for our products. Count on TEKRIS Power Electronics Inc. for your energy needs and enjoy the luxury of having power wherever you go.